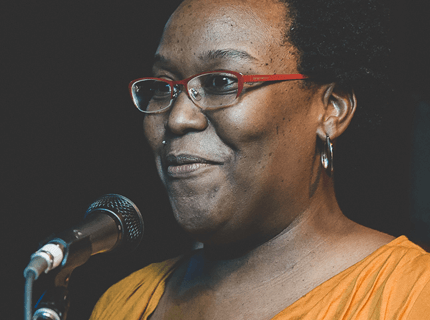 Three-time Omaha Entertainment and Arts Awards poet nominee Zedeka Poindexter envies the performing outlets high school-age poets have today. The March 17-April 20 Louder Than a Bomb is a case in point. There wasn’t anything like it when she was in school. “I was working in a notebook, I always did, but there was no place to go with these things,” says Poindexter, 39, who’s blowing up with her personal anthems about race, family, relationships, loss and blessings. But as a teen her thoughts didn’t find a voice outside her private journals. That’s a far cry from today’s young poets, who have platforms galore for their innermost musings. Poindexter should know since she’s coaches LTAB teams from Blackburn, Westside, Millard West and her alma mater, Omaha North. Just as LTAB gives youth an expressive arena, Poindexter uses slam and other opportunities to evolve her own work. For example, her Union for Contemporary Art fellowship will culminate in a new collection of poems that revolve around family recipes and food as focal point and bridge for familial divisions. She plans a May 2 reading and tasting. “It’s a very different thing trying to write a series of poems that interconnect and relate to one another,” says Poindexter, who’s used to crafting slam’s more instinctive, one-off performance pieces. In 2012 she became Omaha’s only female city slam champion. She represented Omaha at the 2013 Women of the World Poetry Slam in Minneapolis, where she was voted an audience favorite. Her work appears in the WOWPS anthology, Alight. Beyond her Collective circle she’s studied with former Kennedy Center Imagination Celebration poet laureate Stacy Dyson and with storyteller A-Nanci Larenia Stallworth. Recently, she joined novelist Joy Castro and poet Roger Gerberling for a Backwaters Press reading and paired with Nebraska state poet Twyla Hansen at the Kaneko Feedback Reading Series. Being matched with Hansen gave her pause. “Being a slam artist is very different than being somebody who’s devoted their life basically to craft and teaching, which I have not done,” says Poindexter, who’s a thesis away from completing her master’s in communication at UNO. “But it turned out to be amazing. I think there are some people who exist strictly in the performative world and some who exist strictly in academia, but there is a lot of crossover. She appreciates the diversity of the OEAAs and enjoyed doing her thing at last year’s awards show. She often writes about the dynamics of her large African-American family. The Great Migration brought her people from the South to Chicago and Omaha. She mines their rich vein of idioms and imbroglios, delighting in food as a bond that nourishes and heals. Her poem “Poor Relations” discusses her Omaha family line being branded inferior by their affluent Chicago relatives. Born into a family of matriarchs who were “voracious readers,” Poindexter immersed herself in books and writing from an early age. She dabbled in theater and journalism but discovered her artistic home in the emergent slam and spoken word movement. She followed the local slam scene to the Om Center, where it’s still based. She immersed herself in slam in Colorado, where she moved after losing her grandmother and anchor. She returned to Omaha a few years ago to be close to her spoken word soul sister, Felicia Webster, and to her slam girls, Katie F-S and Sarah McKinstry-Brown. She wouldn’t know what to do without her creative community. She’s encouraged by the camaraderie LTAB students display. She’s still struck by what happened a few years ago when a Lincoln High team member lost her mother. Zedeka hosts the Om Center poetry slam the second Saturday of every month. Visit OmahaSlam.com. View her performing at buttonpoetry.com. For Louder Than a Bomb details, visit ltabomaha.org.